Winding along creeks, ridges, and through the forests, the trails are the best way to appreciate the beauty and diversity of Medoc Mountain. 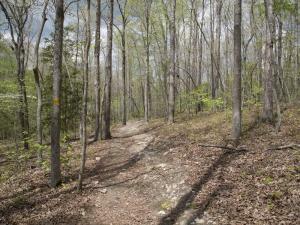 Seven trails wander through a variety of terrain and provide more than 10 miles of hiking. Most of the trails are easy or moderate in difficulty, and trail scenery includes an artesian well, granite outcroppings and miniature rapids. Bridle Trails: For those who prefer horseback, approximately 10 miles of bridle trails travel through rolling terrain and follow a portion of beautiful Little Fishing Creek. Bridle trailhead parking is available just off Medoc Mountain Road. All visitors with horses must be able to provide proof of a negative equine infectious anemia (Coggins) test while visiting North Carolina State Parks. Mountain Bike Trails: Medoc Mountain has nine (9) miles of multi-use mountain biking trails through rolling terrain suitable for riders of all skill levels. Mountain bike trailhead parking is available at the visitor center and riders should follow the hexagon blazes. Follow the directional signs which will veer riders clockwise during even years and counter-clockwise during odd years. The trails will close to riders if wet conditions exist so call the park or check the website before planning your trip. Location: The trail connects the Visitor Center and the Dam Site Loop trail. The trail travels through wooded hills, across a bridge, and through a sunny meadow. Point of Interest: The bluffs offer a beautiful view of Little Fishing Creek over 80 feet below. 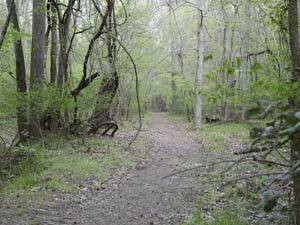 Location: This loop trail is located off of the Moratock Trail. 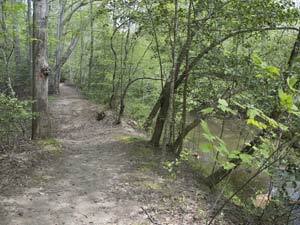 Trail meanders through forested area and travels along Little Fishing Creek. 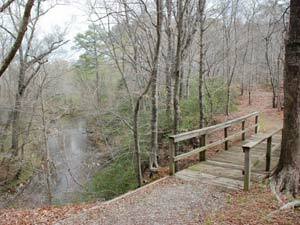 Point of Interest: The Creek Loop provides a serene view of Little Fishing Creek. Accessible from the Bear Swamp trail or the Discovery Loop Trail, the Dam Site Loop Trail covers a wide variety of forest types due to the dramatic changes in elevation along its course. The Discovery Loop trail offers an easy hike that starts along Little Fishing Creek before turning back into other low-land forest areas.